Baksei Chamkrong is another easily overlooked Khmer temple that’s well worth savoring. Harhavarman, the king when Prasat Kravan was built, probably started its construction. 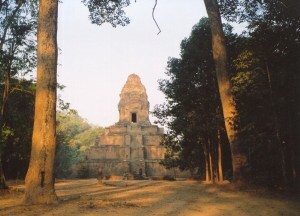 The great king Rajendravarman, the builder of Pre Rup, finished it. Harshavarman started it in the shadow of his father’s great temple Phnom Bakheng. The latter crowns a 200 foot high hill. Baksei Chamkrong is 42 feet high and 88 feet wide. It’s a much humbler effort, but like Prasat Kravan, it set new standards for blending elegance and simplicity. It’s only about half a mile from Angkor Wat. You’ll find Baksei Chamkrong refreshing after Angkor Wat’s overwhelming scale. 1. Its form is simple and very pleasing, like Prasat Kravan’s. The base and tower balance each other perfectly. 2. It’s about the same size as the surrounding trees. You can walk around it and enjoy its harmony with the natural surroundings. 3. Like Prasat Kravan, it’s an exquisitely human-sized temple that was built between the enormous Phnom Bakheng and Pre Rup. A great way to enjoy Baksei Chamkrong and Prasat Kravan is to stand about 200 feet away for a few minutes and savor their formal perfection. Rajendravarman’s minister of public works might have actually created Baksei Chamkrong’s final form on the base of what Harshavarman built. But either way, it represents a time of trying new varieties of art forms. This is the Khmer that most closely resembles the Mayan pyramids at Tikal, with a thin and steep base and shrine on top. Khmers usually went for bulk, and preferred large horizontal frontages. Many other varieties were used by Harshavarman’s uncle Javayarman IV when he built his own royal capital, at Koh Ker, about 50 miles northeast of Angkor. It’s known for a sculptural style that’s lively, which contrasts with the stiff and formal styles associated with Phnom Bakheng and Pre Rup. Pre Rup’s builder, Rajendravarman, would unify the Khmer empire again in the mid tenth century and expand it further. He employed a master builder who erected temples that compete with Phnom Bakheng. But don’t overlook the period between the two great builders. The Khmers were testing new art forms and expanding the range of what they could make. Their best products are almost as memorable as Angkor’s biggest monuments. They show that Khmer culture remained a fountain of creativity throughout its history. There’s much more at Angkor than Angkor Wat.